I've finally found my way back to working with lots of colour! 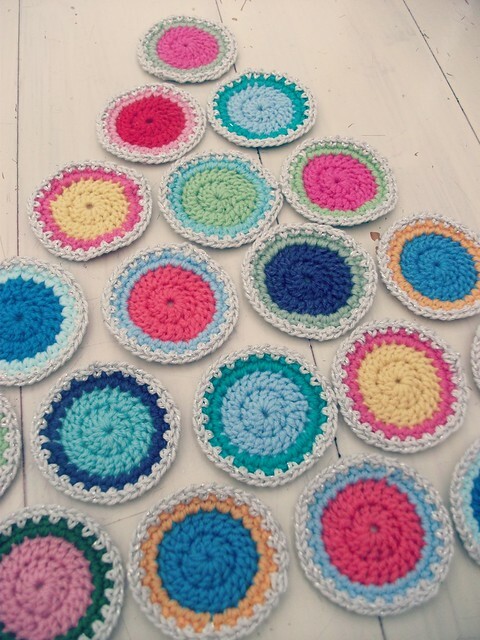 These colourful crochet circles are edged in a off-white colour with a silver thread running through. I'm not sure how easily you can see the silver here. It has been a fun and sparkly project to work in the evenings. 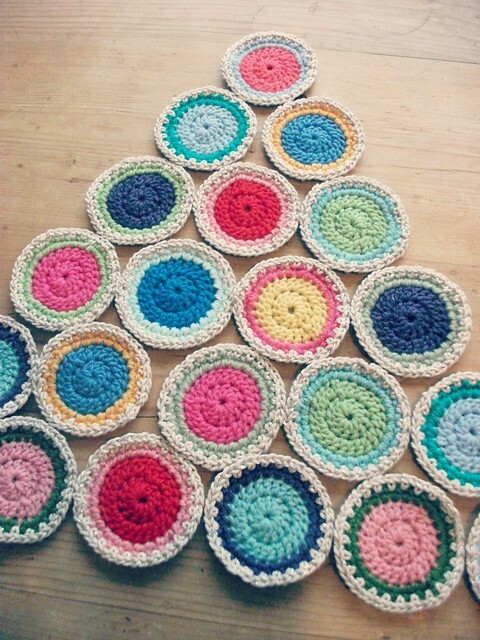 The idea was sparked by Ale's christmas tree project and the need to wip up a few christmas presents. 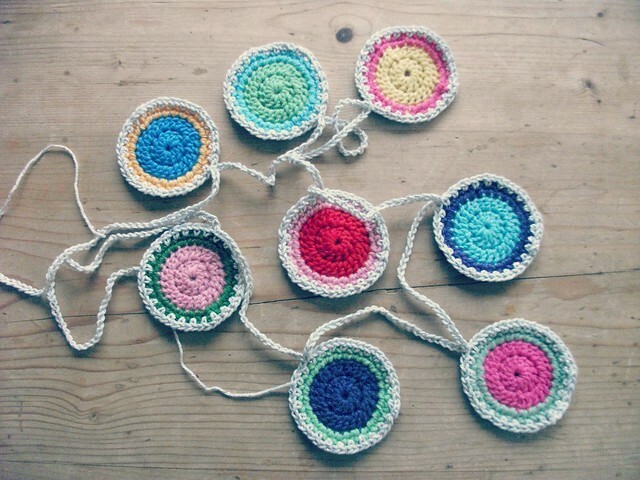 I used Debi at hooks and yarn's pattern for her squircle using the pattern for the first two rounds of trebles. Then I added a further round of single crochet and then a border of alternating single crochet and a chain. Does that make sense?! I think you can see the sparkle here and i'm having fun with the photos. So as it's christmas I'll get them all out! of course I wanted to keep them all! but knew i wasn't going to......they were destined to become 'happy garlands of colour and sparkle' and on their way to add some cheer in other folks homes! and it was so hard to see them go that I had to make myself a little one too! It's looking quite festive here now. The tree is up. I just love the smell of tinsel! and my woollies tree. It has a very definite christmas smell! Tonight I will look for some greenery and a lovely candle to burn as today is the winter solstice. It's nice to mark the return of the light and longer days in a peaceful and warm way, thinking of hopes and wishes for the future. 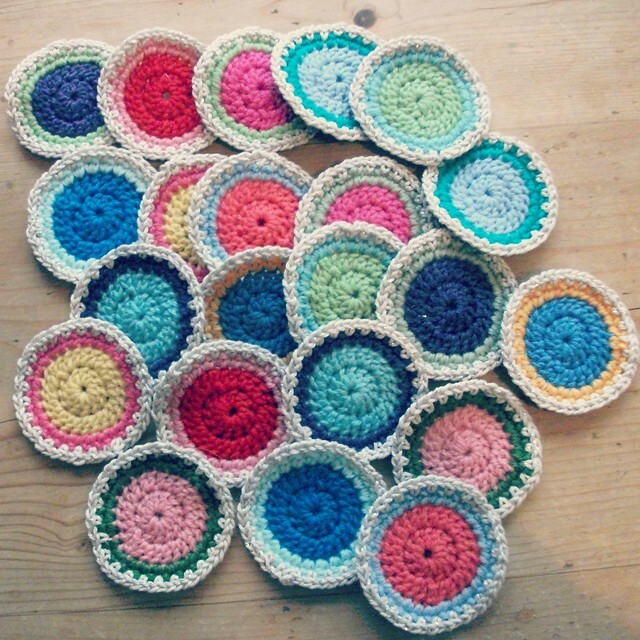 ….such a sweet and colourful post Heather…. Lovely all those pretty colours! Ale is inspiring lots of people, isn't she? 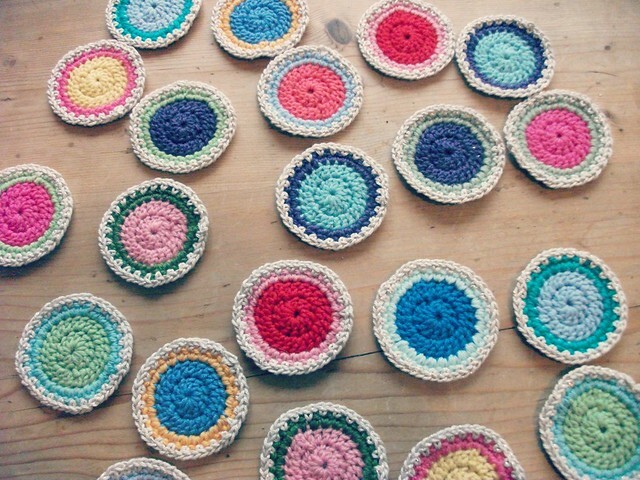 How sweet are these little circles Heather! At first I thought...look---she made a little tree out of them but as I kept reading there were meant for garland.....it was the icing on the cake for me......loved them even more!!!!!! Hi Heather, and a happy solstice to you too!!!! 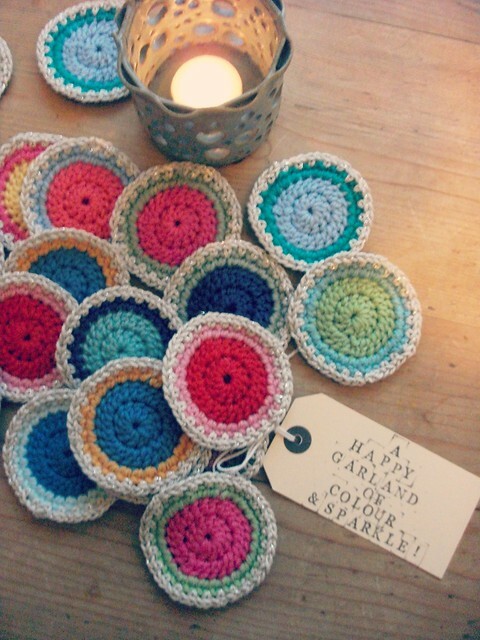 Love your happy circles of color and sparkle!!! A happy garland to decorate with this Christmas!!! Have a fab day!!! 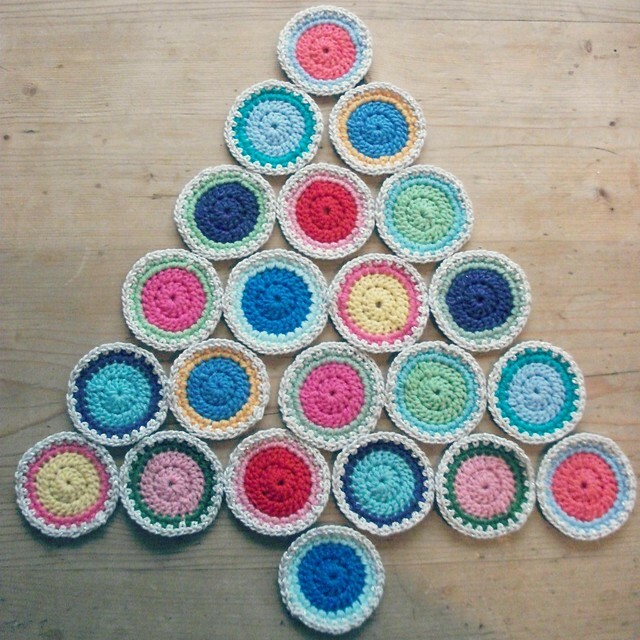 The crochet circle christmas tree looks fab! Never tott it s gonna be a bunting, but loved it anyways..Smart lady with smart n witty color choices! So pretty ... and so festive with all that sparkle. Just lovely Heather, a garland of colour and sparkle ... perfect! Love the colours and what a lovely gift. 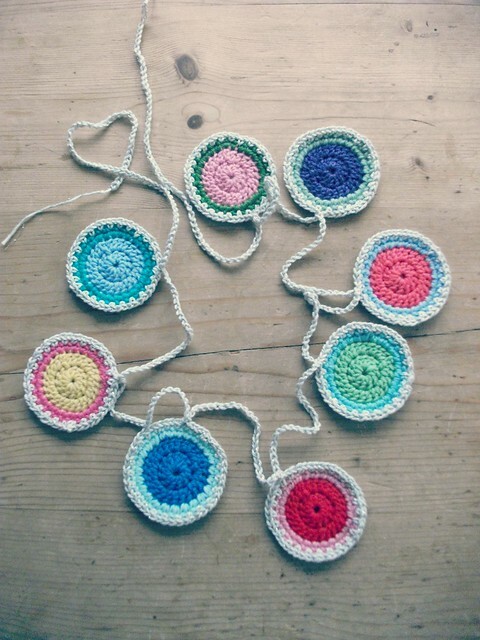 Your 'pattern' made me laugh- I've only just learned to read simple written crochet patterns as I was previously a make it up as you go along crocheter so your pattern actually makes much more sense to me. Oh how beautiful - this garland has made my eyes very happy, thankyou!